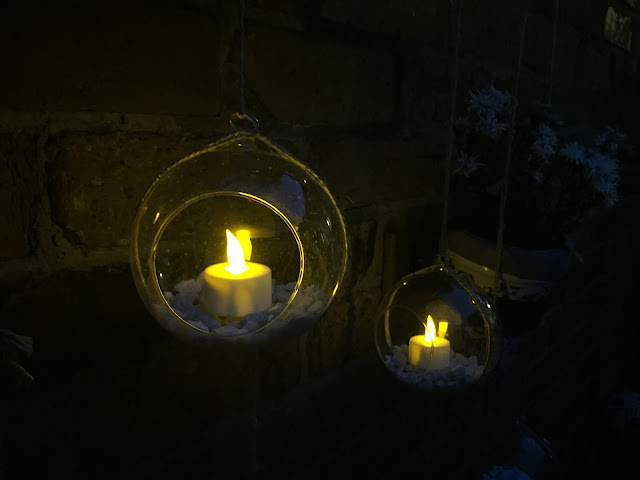 3 Ways to Light Up the Garden! 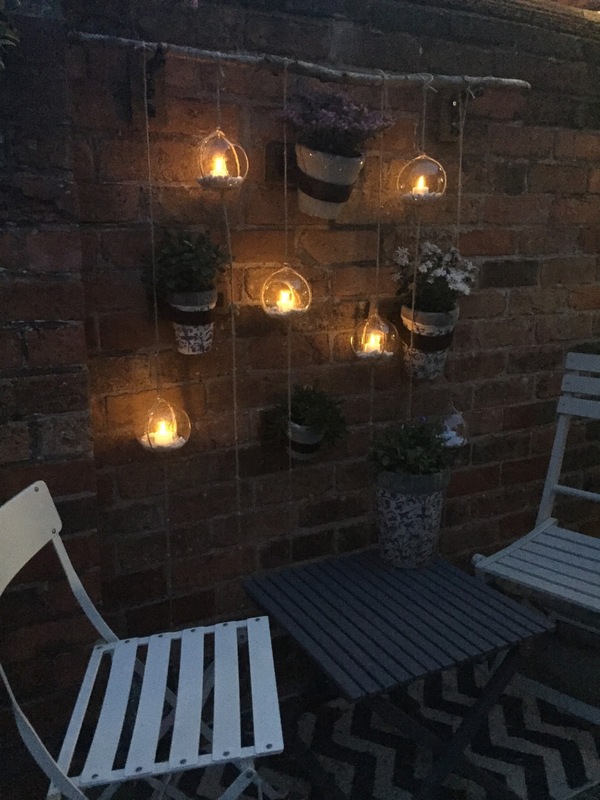 After having recently built our new pallet seating in the garden, I was on a mission to find some glorious outdoor lighting so that we can use our new little corner (and the rest of the garden!) even when the sun goes down. In our last house we had two sets of super awesome net fairy lights around our outdoor seating. You can see what these looked like here. 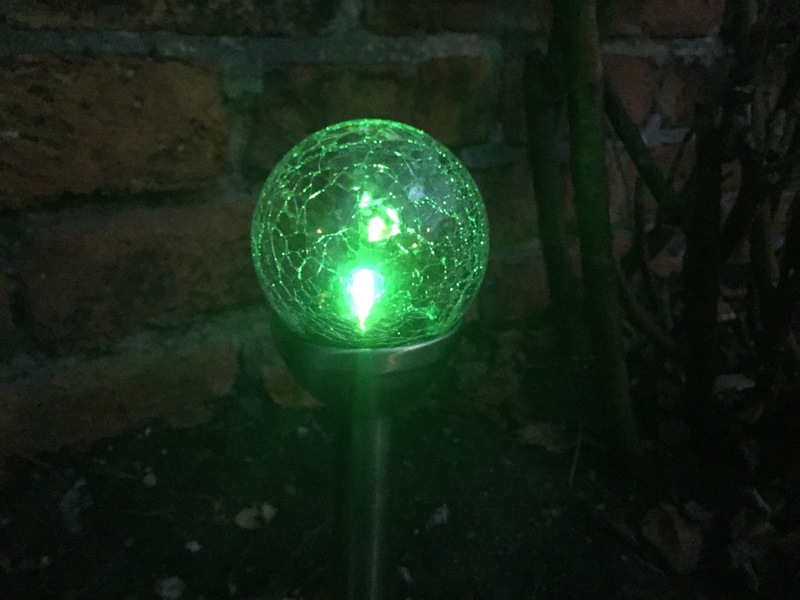 Whilst I loved them and was gutted to leave them behind, (our estate agent encouraged us too) I was also quite excited by the prospect of being able to buy and try new lighting in our new garden. So I've been doing some browsing and a bit of shopping - and I thought I'd share what I got. Our requirements were simple: solar powered and affordable. Each option is a little different to the next, and I am loving them all! 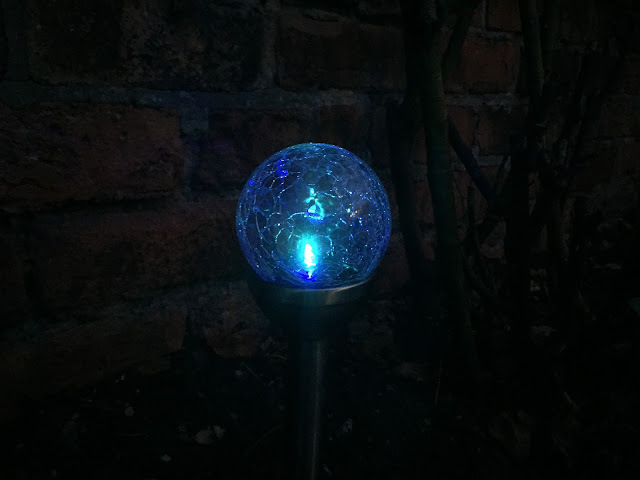 These solar powered Chinese LED fairy lights are from lights4fun.co.uk which is the same retailer I used for the net lights in our last house. They cost just £9 and they actually illuminate the area really well! 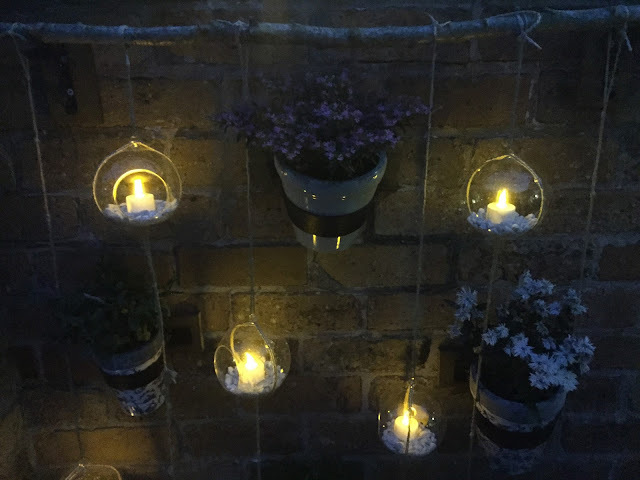 I chose these because they're quite large in size compared to just a little bulb on normal fairy lights and I wanted to make a bit of a feature out of the fencing behind. I think they do a pretty grand job! They're better than I ever imagined and they're actually really quite bright too! They illuminate the seating area much better than I anticipated and it's good to be able to actually see in the dark now! These are probably my favourite purchase - plus the cheapest! 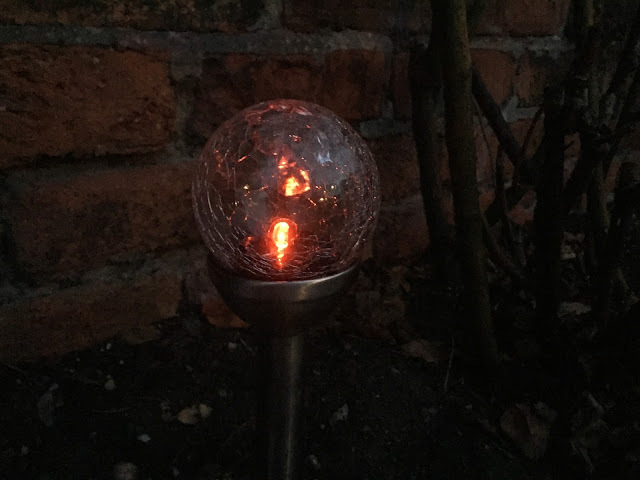 These solar powered crackle glass colour changing stake lights are also from lights4fun. How could I possibly resist - did you hear the words colour changing! Oh they're simply gloriously awesome! I love the crackle glass effect and the mesmerising effect of the changing colours. I've put these in-between the roses at the back of the garden and they add a really nice little feature to look out to. They're not as bright as the Chinese lanterns and they definitely don't light up the area, but they are simply beautiful to watch and they cost just £15. I created this garden feature hanging wall earlier this month, but I was yet to show it off at night-time! These lights are LED solar powered candles from wayfair.co.uk. The lights actually flicker as if they were candles. I love the fire colour they produce and for a small little light, they're pretty bright too! They come in a pack of 6 with a little docking station to charge upon. They're actually intended for indoor use, so mustn't leave them outside in the rain(!) but I think they're fab for the garden! These were the most expensive option costing £28. I would literally cover the entire garden in lanterns and fairy lights if I could. I have a real thing for the magical kind-of glow they bring. 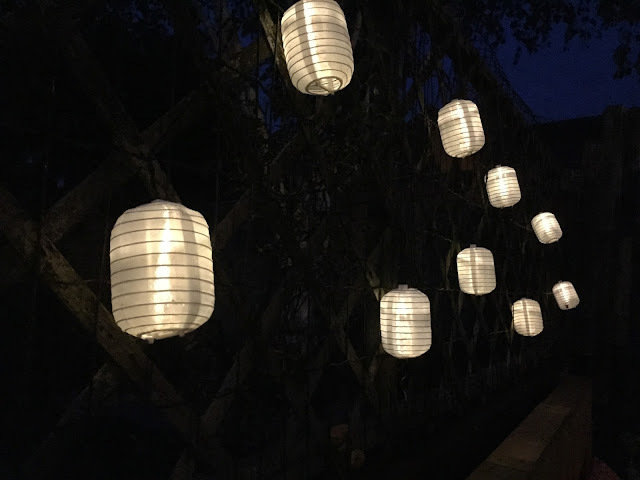 Do you have any lights lighting up your garden?